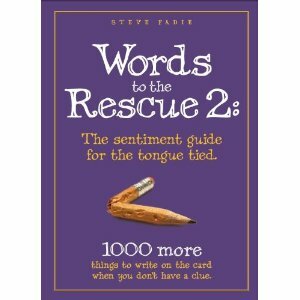 The sentiment guide for the tongue tied. 1000 thoughtful things to write on the card when you don't have a clue. 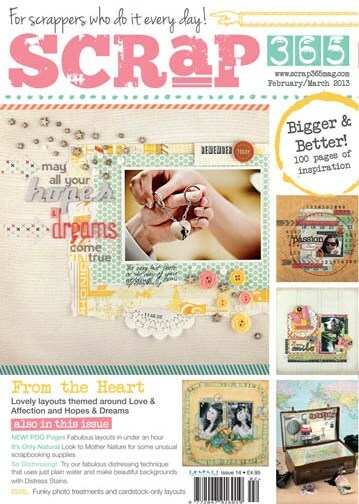 153mm square idea book by Pebbles Inc.This sweet little book presents photographs of many lovely ideas. 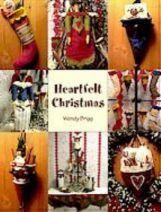 Heartfelt Christmas is a collection of 8 simple Country Friends Christmas projects to make as gifts or to decorate a home. Booklet consists of 20 pages plus patterns: Christmas Angels, Christmas Stocking, Christmas Cones, Christmas Banners, Christmas Hearts. 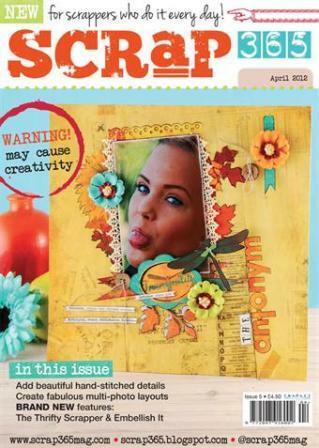 Latest issue of Scrap 365. 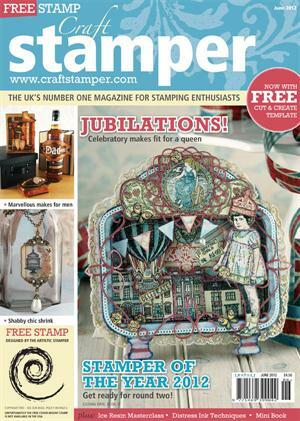 THE magazine for scrappers! 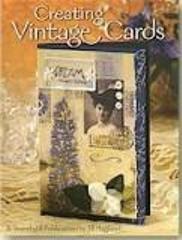 Mini Book Special: 5 miniature marvels to make. Here Comes the Summer! 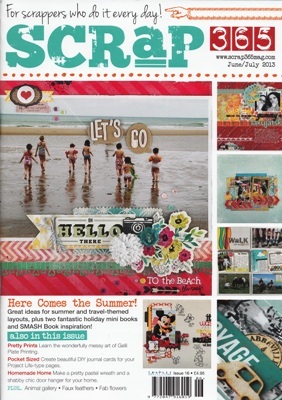 Great ideas for summer and travel-themed layouts, plus two fantastic holiday mini books and SMASH book inspiration. 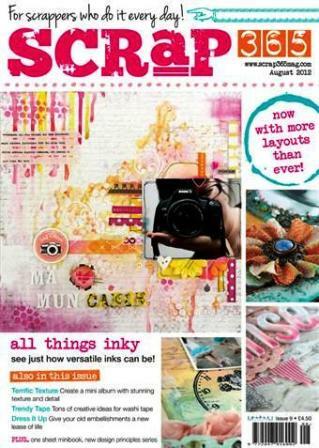 Pretty Prints: Learn the wonderfully messy art of Gelli Plate Printing. Pocket Sized: Create beautiful DIY jurnal cards for your Project Life-type pages. Homemade Home: Make a pretty pastel wreath and a shabby chic door hanger for your home. Boys Zone: Celebrate the men in your life with inspirational gallery layouts. Hardware Heaven: Embellish your pages with fabulous DIY store finds. Getting to know you: Find out how our designers create their own unique pages in the new Signature Style feature. PLUS: Hidden journalling & Scrabble tile pendants. Scrap 365. 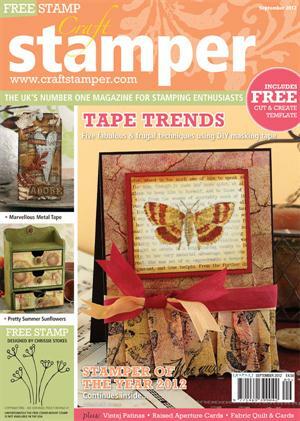 THE magazine for scrappers! 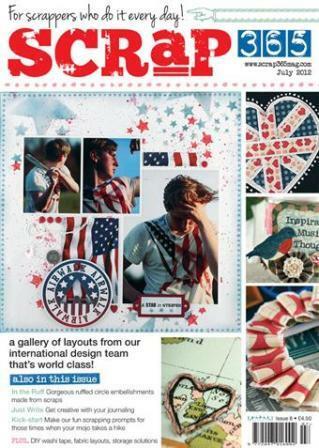 The issue is jam-packed with inspirational layouts from around the world. 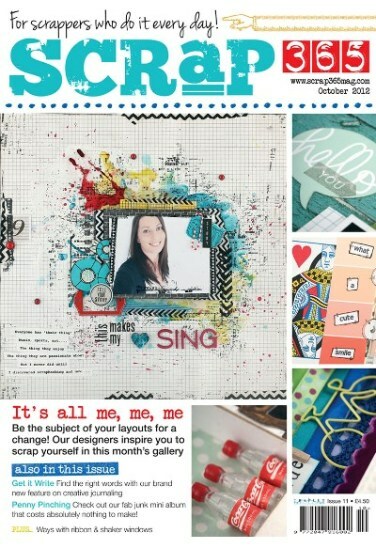 This month we also have a new series on journaling. Most of us shy away from journaling on our pages and many of you have asked for inspirational ideas. 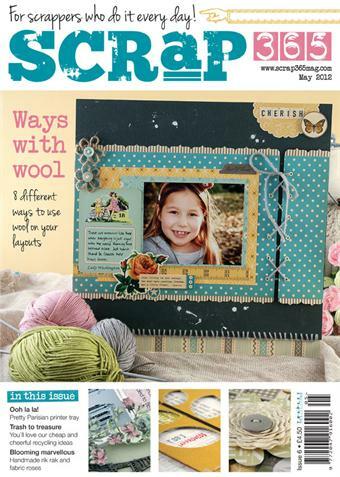 So the new journal series will look at various ways for incorporating stories and text on our pages. Penny pinching? 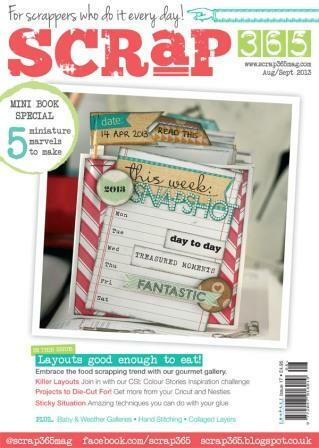 Check out our fab junk mini album that costs absolutely nothing to make. 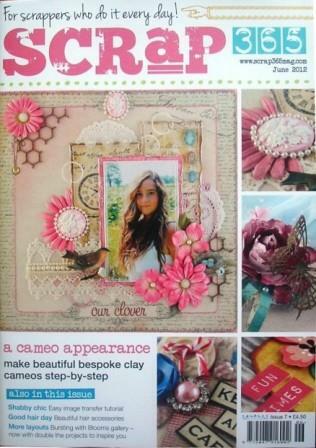 This month there are fabulous technique tutorials for clever stenciling, easy image transfers as well as inspirational mini-books, home decor pieces and so much more. The galleries are packed with beautiful, layouts that are sure to get your creative juices flowing! In the Ruff: Gorgeous ruffled circle embellishments made from scraps. Kick-start: Make fun scrapping prompts for those times when your mojo takes a hike. 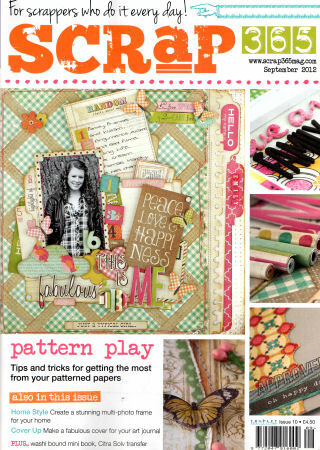 PLUS: DIY Washi tape, fabric layouts, storage solutions, and a world class gallery of layouts form the Scrap365 design team. 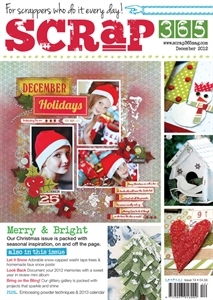 Scrap 365, THE magazine for scrappers! Blooming Marvelous - Hanmade ric rac and fabric roses. 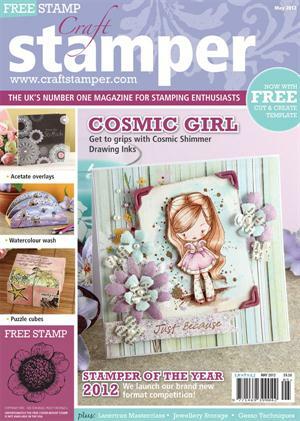 Craft Stamper magazine. Filled with projects, tips and techniques. 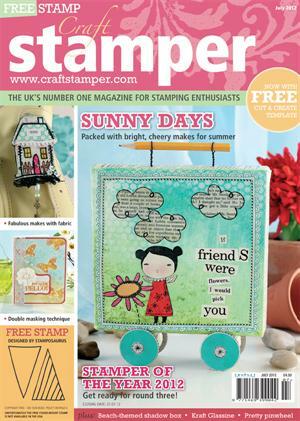 Free stamp with every issue. 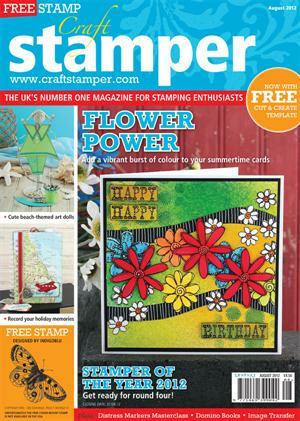 This months free cover mount stamp is a lovely vintage-style flower stamp.